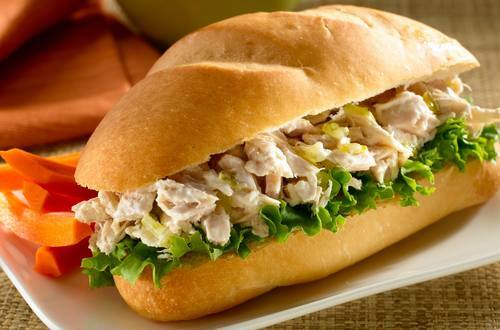 1 Combine tuna, Hellmann's® or Best Foods® Real Mayonnaise and relish in medium bowl; set aside. 2 Fill rolls with tuna mixture and garnish with lettuce leaf if desired. To make these kid-friendly make this Race Car Hoagie: Use sliced pepperoni for ''steering wheels'', grape tomatoes for ''drivers' heads'', broccoli for ''hair'', black olive for ''eyes'', thin pretzels for ''drivers' arms'' and ''tire axels'', cucumber slices for ''tires'', slilvered black olives for ''hubcaps'' and ''headlights''. TIP: For Cell Phone Sandwiches, use rectangles of red and green bell peppers for ''screen'' and small squares for ''numbers on keypad''. Insert thin pretzels for ''antennae''.